Combine all ingredients for pesto and blend with a kitchen whiz, a hand blender or a mortar and pestle. Set aside. Cook pasta according to packet instructions. Stir through pesto, cover with lid and set aside. Steam or blanch green beans. Season chicken fillets with salt and pepper. Over a medium heat, heat oil in a heavy based frypan and cook fillets for around 5 – 8 minutes each side or until cooked through. Towards the end of cooking time, add tomatoes to pan. Let fillets sit for several minutes before slicing. 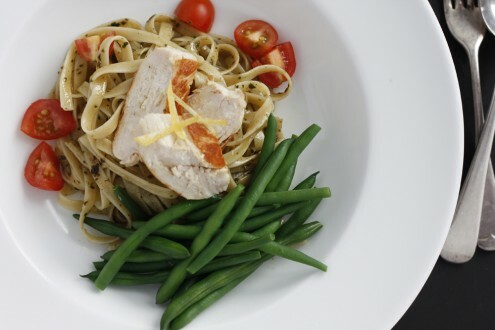 Serve approximately 100g/3.5 ounces of pesto pasta per person, topped with sliced chicken, tomato and green beans. Post GDM-suggestions: Add 2 tablespoons of toasted pine nuts to the pesto mixture and blend. Pesto Pasta is a delicious recipe, if you enjoy white meat dishes, this is a real treat. This healthy meal is tops for summer or winter, and I can highly recommend it. Children and adults alike love this dish. Yours truly, Sandy Green. This was great! Yummo! I have made extra so I can have some pesto pasta for lunches. Does it make a difference in the nutrition of this dish if I substitute a different meat? For instance, may I substitute chicken thighs or salmon? Will this affect an individual with GD? Why are the pinenuts only suggested for post-GDM?